The Nokia Conversations blog is keeping their streak up posting applications and games that keep them occupied on their Windows Phones. This time we take a look at their five favorite sports games on the Windows Phone. PES 2012 has quite the reputation on all platforms the game is available on. When PES 2012 became available on the Windows Phone, fans all around the world were excited at the news and were ready to jump in and play. Unfortunately, it meant the previous version of PES 2011 would be pulled from the Windows Phone Marketplace, for whatever reason. Either way, there is a good reason why PES 2012 is at the top of Nokia’s favorite sports games list. The only Xbox LIVE title in this list is PES 2012. All other games below are independent games published outside of the Xbox LIVE collection on the Windows Phone. Click the title of any of the games below to visit the Windows Phone Marketplace listing. Pro Evolution Soccer is a full-on football experience. You play as a member of a team and you need to beat the opposition using your ball-skills. With realistic graphics and animated cut-scenes you’ll feel like you’re part of the action. You don’t have to be an expert to play this game as the uniquely designed “true flow™” control makes it easy to for people of all levels. The sound of rubber souled trainers squeaking across a polished floor is enough to put anyone off going to an actual basketball game. Instead, Badass Basket is the perfect way to get your basketball fix. Jimmy is a little lad, a bit too short to make the team, so he plays alone. He has to take it to the streets to become the best player he can be. Help him by launching balls at the net and win the one-on-one challenges. In any football match, the moment people dread is the penalties (or free kick). It’s you against the keeper. 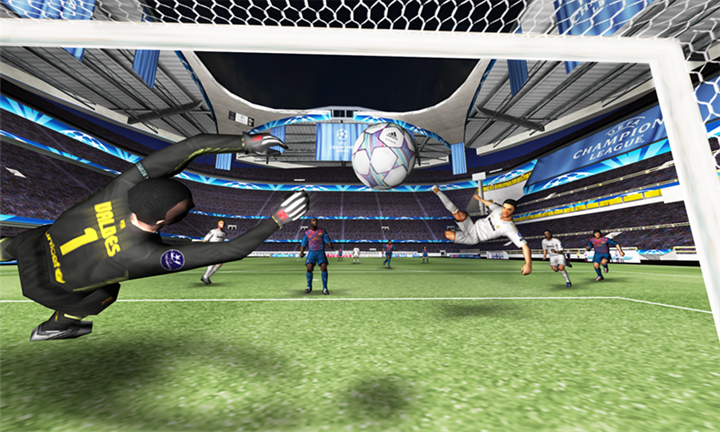 With this game you can practice your shooting skills from the edge of the keeper’s box using a 3D physics engine. This means that with some skill you can curl one in the back of the net. Everybody loves crazy golf; don’t they? Well, if you do, here are 36 holes for you to attack. As with most crazy golf courses, putting the ball isn’t straightforward. You’ll need to bounce your ball around the course using realistic physics. There’s a nice leader board feature, too, to see how you compare to other players around the world. Rather than strapping on those padded gloves and putting that box down your trousers, play cricket the easy way; with a simple tap of a finger. There’s really no skills needed for this game. As the ball approaches from the right, tap the hit button at the right time and your batsman will whack the ball. The score of each hit will depend on your timing. What are you favorites sports games on the Windows Phone? Tell us in the comments below!